You may know that the First Republic in France resulted from the French Revolution. But France has had five republics. And there were two empires and four revolutions. Why so many? Here is a brief guide, with some events omitted. A republic is a political order whose head of state is not a monarch, a monarch being an absolute or ceremonial head of a state government: a king or queen, a prince or princess, an emperor or empress. It also describes a state in which power lies in the body of citizens who are entitled to vote for representatives responsible to them. The National Convention. The Convention created the Committee of Public Safety to maintain public order and Maximilien Robespierre became its leader, effectively controlling France. During the Reign of Terror that followed, over 40,000 ‘enemies of the revolution’ were executed, until Robespierre’s own execution in July 1974. The First Republic was proclaimed on 21 September 1792 by the newly established National Convention. This was in the third year of the ten years of the French Revolution which had started in 1789. The Revolution overthrew the Ancien Régime, the monarchic dynasties that had ruled France since the 15th century up until the last Bourbon king, Louis XVI (‘L’état, c’est moi’ – I am the state). By the late 1780s, France was in desperate financial trouble and Louis XVI, who believed he ruled by divine right, brought together the Estates General to try to solve France’s problems. The Estates-General, which met only rarely, was made up of assemblies of the First Estate, the clergy, the Second Estate, the nobility, and the Third Estate, the commoners, though in practice they represented the bourgeoisie. However many members of the Third Estate (who were to call themselves the Communes or Commons), met on their own and demanded a new constitution. The communes re-formed themselves into a National Assembly on 17 June 1789. Events followed quickly. 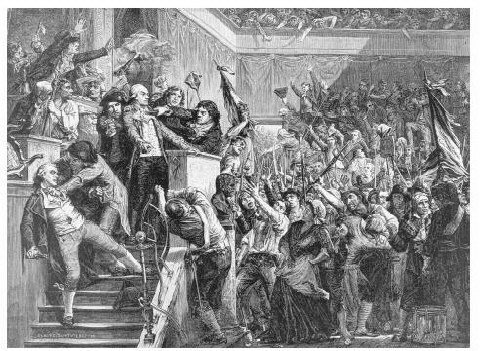 First the Tennis Court Oath (link) on 20 June, when all but one of the assembly believing themselves to be locked out of the meeting of the Estates-General, pledged not to separate until a new constitution was agreed. This was the first time that French citizens had formally stood in opposition to the king. When King Louis XVI refused the Assembly’s request to remove troops from Paris, public outrage precipitated the storming of the Bastille (which was seen as a symbol of the abuses of the monarchy) on 14 July, marking the beginning of the Revolution. The draft Declaration of the Rights of Man and of the Citizen followed in August. The epic march to the Palace of Versailles in October by women protesting over the high price and scarcity of bread, forced the king and his family to return to Paris, effectively ending the independent authority of the king. The assembly, which had reconstituted itself as the National Constituent Assembly, became the effective government of France, and King Louis XVI was forced to recognise its authority. The First Republic saw the execution of King Louis XVI in January 1793 (‘Louis must die that the country may live‘ – Robespierre), and the infamous Reign of Terror (link) from September 1793 to July 1794, the period of violence incited by conflict between rival revolutionary political factions. The First Republic ended when following the years of instability and upheaval, Napoléon Bonaparte, who had conducted successful military campaigns during the period of the Revolution, became ‘Emperor of the French’ (‘France has more need of me than I have need of France’) following a plebiscite in his favour in November 1804. He was crowned Napoleon I on 2 December 1804, the first monarch of France to bear the title of emperor since AD 887. During this, the First French Empire, Napoleon embarked on a period of militarism, which led at first to spectacular military victories, but eventually to defeat and personal exile. The Empire fell with Napoleon’s abdication at Fontainebleau in April 1814 following the capture of Paris by the Coalition forces (Great Britain, Prussia, Russia, Austria and others) in March. Louis XVIII then ruled France as the head of a constitutional monarchy. He was followed by his younger brother Charles X, who was overthrown in 1830 by the July Revolution (or Second French Revolution), when Charles’ cousin, Louis Philippe. Louis Philippe had been offered the throne by the elected Chamber of Deputies, but this angered republicans who saw one king replaced by another. Discontent simmered, and in June 1832 there was an unsuccessful, short-lived rebellion of anti-monarchist republicans in Paris, the June Rebellion (or the Paris Uprising of 1832) (link). Author Victor Hugo described the rebellion in his novel Les Misérables. Liberté, Égalité, Fraternité, the national motto of France, was only one of several slogans that were in and out of favour at different times. The words ‘ou la mort’ (‘or death’) were dropped for being associated with the Reign of Terror. Louis Philippe was overthrown by the February or 1848 Revolution (and Third French Revolution), one of a wave of revolutions across Europe. Over three days in Paris, rioters supporting the republican cause took control of the capital. However liberal republicans’ hopes of establishing an enduring democratic regime were soon frustrated, with the election by popular vote of Prince Louis-Napoléon Bonaparte, nephew of Napoleon I, as President on 2 December, together with a monarchist majority in the legislative assembly. The motto Liberté, Égalité, Fraternité, that is liberty, equality, fraternity (or brotherhood), was adopted, though this was rescinded in early 1852, only to be re-adopted during the Third Republic. The republic ended with a coup d’état on 2 December 1851 staged by Louis-Napoléon. He ascended the throne as Napoleon III exactly one year later, ushering in the Second French Empire. The Franco-Prussian War of 1870–1871 ended with Napoleon III’s capture on 2 September 1870 at the Battle of Sedan, the French border fortress, and the overthrow of the empire two days later when news reached Paris. Adolphe Thiers, the first President of Third Republic called republicanism ‘the form of government that divides France least‘, but its politics were sharply polarized. On the left marched Reformist France, heir to the French Revolution. On the right stood conservative France, rooted in the peasantry, the Church and the army, led by traditionalists. A barricade in the Paris Commune, March 1871. 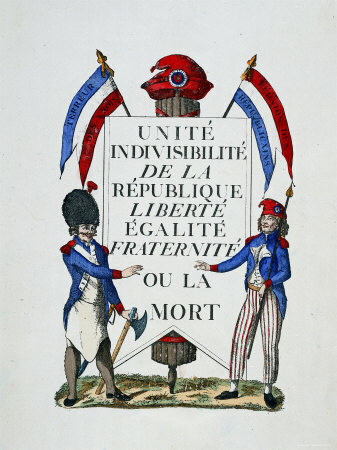 The Communards called for changes reminiscent of 1793, but were unable to organise themselves militarily, and 20,000 were killed by troops of the government in Versailles. 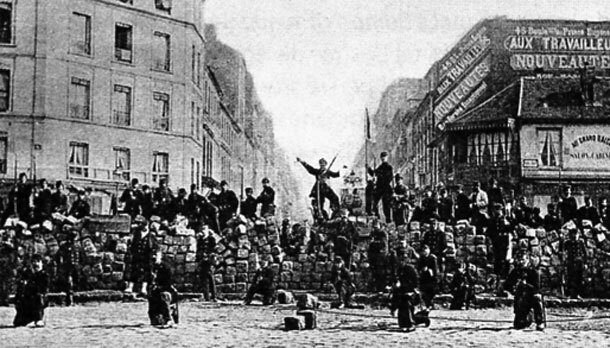 The Paris Commune (the Fourth French Revolution) was a revolutionary regime (link) that briefly ruled Paris for two months from March to May 1871, though the majority of the commune looked back to 1792 rather than forward to socialism. It arose from discontent amongst the workers in the aftermath of France’s defeat in the Franco-Prussian War and Thiers’ attempts to disarm the national guard in Paris. It proclaimed its own authority to govern all of France, but it was brutally suppressed by the army. Despite these conflicts, the republic lasted for seventy years, making it the longest lasting system of government in France since the Ancien Régime, and the first to win the support of the majority of the population. It ended with France’s defeat by Nazi Germany in 1940, and its replacement by the collaborative Vichy France government (link) under Marshal Philippe Pétain. Charles de Gaulle, French general, leader of the Free French during World War Two, architect and first president of the Fifth Republic. His political ideology of national independence in foreign policy, and social conservatism, ‘gaullism’, has been a major influence in French politics. France adopted the constitution of the Fourth Republic on 13 October 1946, but the political divide that had existed before the war remained, and the republic saw frequent changes in government: twenty-one administrations in its twelve-year history. After a series of crises, most importantly the Algerian crisis of 1958 (link) when the army threatened the government not to withdraw from Algeria, the Fourth Republic collapsed. 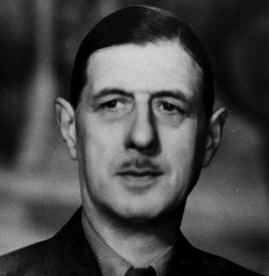 Charles de Gaulle returned from retirement to preside over a transitional administration which was empowered to design a new French constitution. The Fourth Republic was dissolved by a public referendum on 28 September 1958, in which 79% of those voting supported the new constitution, to be replaced by the Fifth Republic. The Fifth Republic, the current republic, introduced on 4 October 1958, replaced the previous parliamentary government with a semi-presidential system. Under the new constitution, French Presidents were given a very long seven year term of office (changed to five years by a referendum in 2000), and with more power than most of their European counterparts. In 1971, there was a challenge to a statute passed by the French Parliament, that it violated freedom of association, and hence the rights defined in the 1789 Declaration of the Rights of Man and of the Citizen. A constitutional amendment was passed in 1974, that by widening the existing prerogative, had the effect of the opposition being able to have controversial new statutes examined for constitutionality. Many laws and regulations have been cancelled as a result, including taxation legislation that created an unwarranted difference between citizens, and suggested positive discrimination on ethnic grounds because by establishing categories of people who would, by birth, enjoy greater rights, they infringed the principle of equality. The Fifth Republic is France’s third longest political regime, after the pre-revolutionary Ancien Régime and the Third Republic, and is considered the most stable.